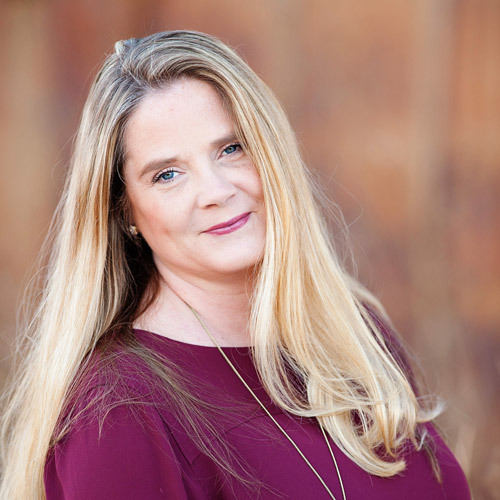 Welcome to the Paper Issues Blog Hop!! Im linking this project up to the Paper Issues Tree Hugger Linky Party! 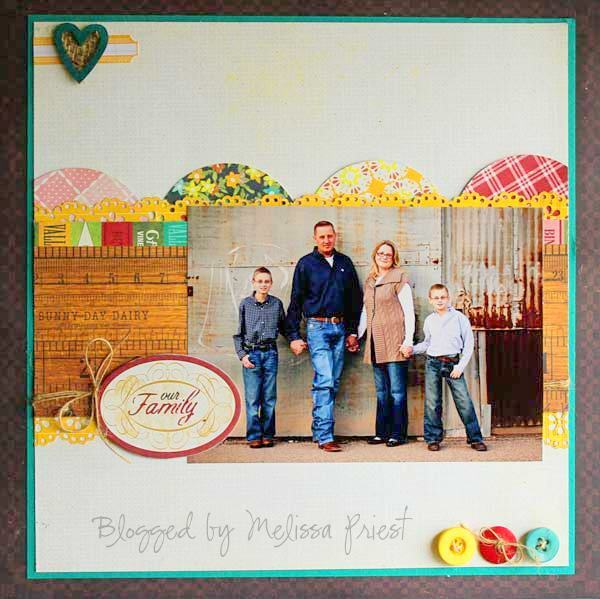 For the Paper Issues Blog Hop, I created this page of my family using the new Crate Paper Farmhouse collection. I *just* got this paper collection in from the Paper Issues Store ( you DID know we have a store, riiiight???). Use the coupon code of HOP25 to receive 25% off your order now through Monday. Want to win this collection of 15 sets of American Crafts Thickers??? Become a follow of my blog and leave a comment that you are following me now, and I will draw a winner on Monday!M ake sure you leave an email adress for me to contact you at if you want a chance to win! Edited to add: to become a follower, look to my sidebar and notice that there is a heading that says "Friends" and a 'Join This Site' button. Click there & it will take you to the steps to become a follower! Ready for the next stop on the Paper Issues Blog Hop?? Then head on over to meet Joan Lidell. If you get lost on the Blog Hop, here is the order! Hi Melissa! Please don't include me in your give away..though it is AWESOME! I just wanted to leave some love on your page about your page! I love the colors and design! Beautifully put together! I am swooning over your layout, wow! What is it about Thickers that makes everything even better? Love those things! This page is seriously gorgeous Melissa- the color, the design WOW!!! Major pop from this page. The link is still live in the altered projects hop- I'm so sorry about that but hopefully it will get fixed asap. Melissa your page is AMAZING, I love it!! You are one talented lady!! Don't include me in your giveaway, although I LOVE Thickers!! Beautiful layout and photograph! I woud love to be included in the Thickers drawing! I think my internet is having issues because i can't find the followers button on your blog, but I'll keep looking because I really enjoy your work! Lovely photo and great page. I love all the detail yuet the clean look to it. I'm a follower! Very cute layout--I love the Farmhouse collection. I can't wait to get my hands on some! new follower :) beautiful layout!!! That layout is all kinds of amazing!! I just love it! I am already a follower on your blog, thanks for the chance to win!! I love the layout of your blog. And your page is adorable. I'm a new following and super excited about your give-away. I LOVE Thickers! What an awesome, generous prize. I hope I win! Don't enter me into your giveaway - but it looks AMAZING! New follower here too. Following your blog now... lovely ideas! love that picture....and saw it is also featured on 2 peas...huge congrats!!! Following your blog now. Love this layout. My internet must be weird too, I can't find the link to become a follower either...but I will come back! Your page is great - I love the bright colors you used!!! Don't include me in the drawing; just stopping by. Love, love, love your layout! I love scrapping larger pictures on special pages and this IS a special page. 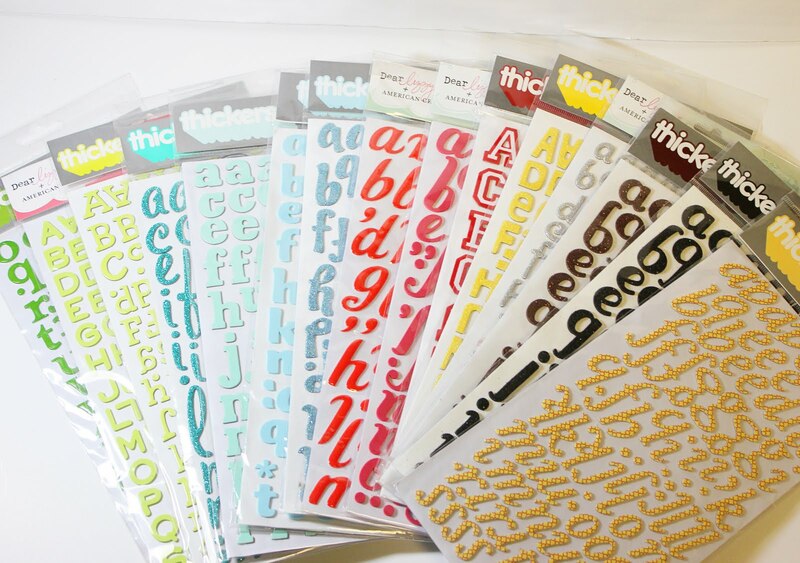 Thanks for the chance to win Thickers....I am a bit of a Thickers addict! Just love your layout, those semicircles of pattern are great interest. Thank you for sharing. What an absolutely gorgeous layout! I LOVE it!!!! the balance, the colors, the buttons...perfection!! Great layout--love the Farmhouse collection. I became a follower. Wonderful page!! And thank you so much for a chance to win such a fantastic giveaway! !I am a follower now-and I would love it if you wanted to visit my blog too! I love your work. So glad I found your blog. Love the layout, I'll have to scraplift it! Melissa...LOVE IT! I will have to lift this one...it is one of the cutest layouts I have seen that I want to re-create! Perfect! i am so in love with your LO...the fab photo, the bright colors & those perfect scallop circles! all amazing!! and, i so wish i could win your prize because not only do i adore thickers, but i've been trying to find some yellow ones for months (literally) & have not been able to...ugh! so glad to be on the team with ya girlie! hugs!